For rescuers who uncover an abandoned animal, sometimes it can be difficult for them to assess what happened to the poor creature. The only thing they know for sure is that the animal needs help. 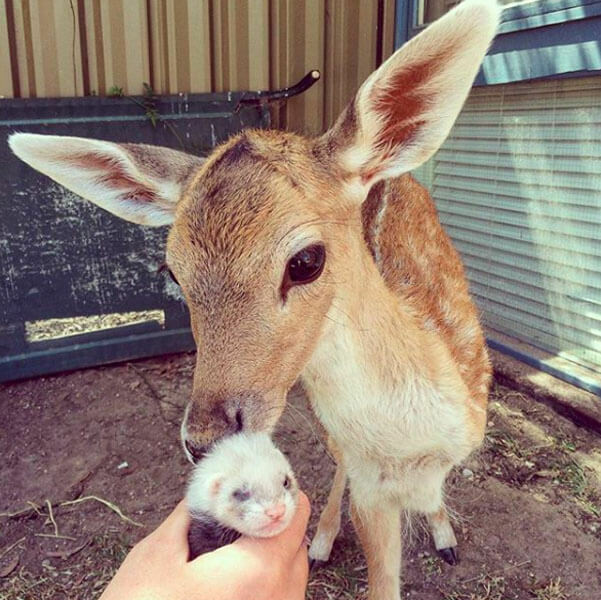 In the case of an Australian fallow deer named Rudie, a group of strangers found him a few days after his birth. They realized that one of his legs was missing. 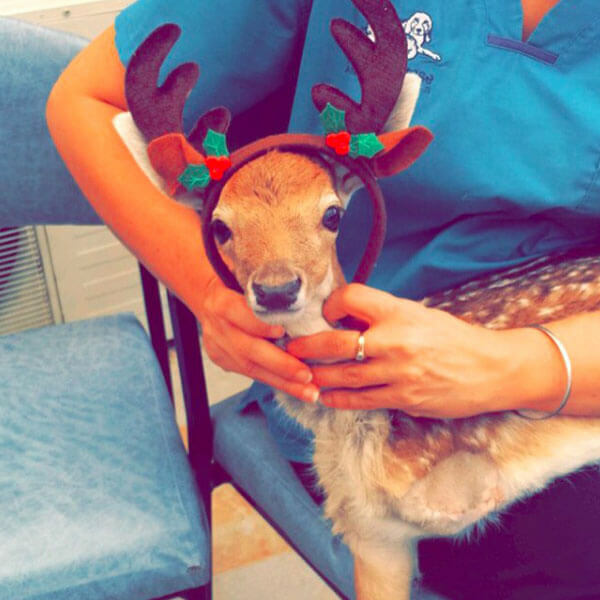 More than TLC was needed for this little guy, so they rushed him to the veterinarian. 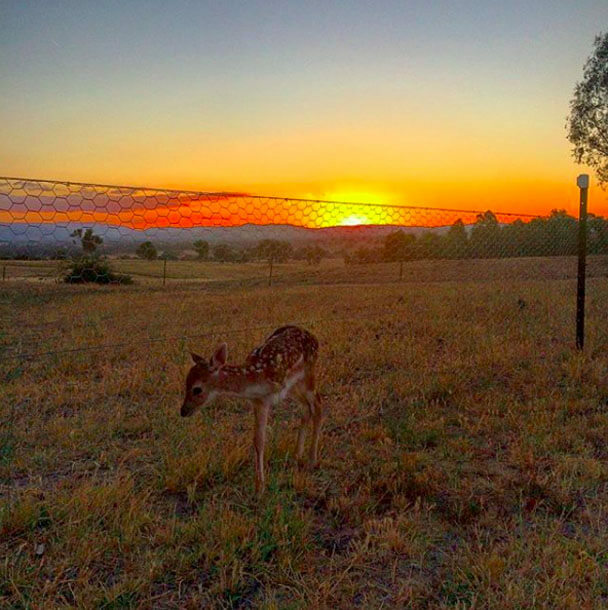 Encountering a wild, abandoned animal isn’t something most people enjoy. Animals are living, breathing creatures that deserve to exist on this Earth. For people to harm them is outright egregious. But on the other hand, if an animal is left by their pack or family for some reason, that isn’t something that people can’t control either. 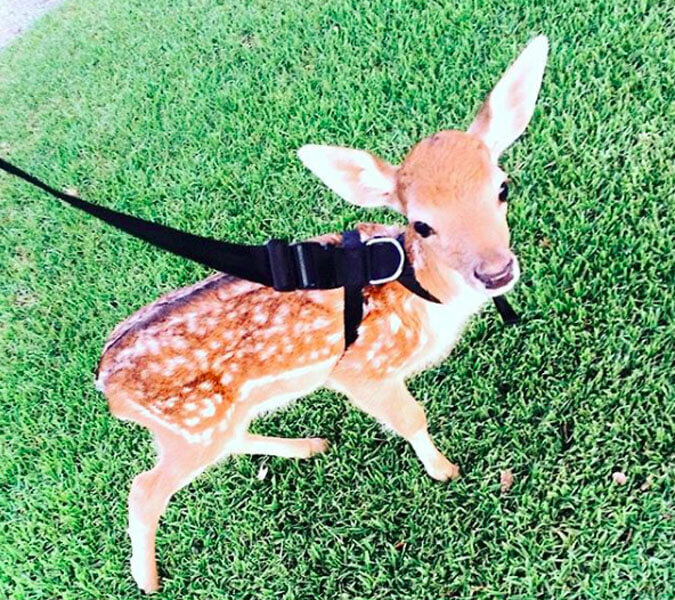 When rescuers find a stray or abandoned animal, it might be difficult to assess the situation initially. This makes helping them a bit challenging at first. 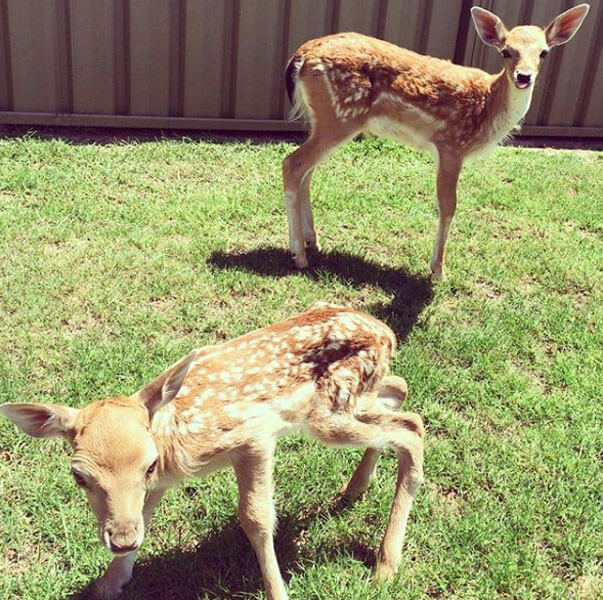 In Australia, a fallow deer named Rudie was born, and two days later found in a heartbreaking condition. 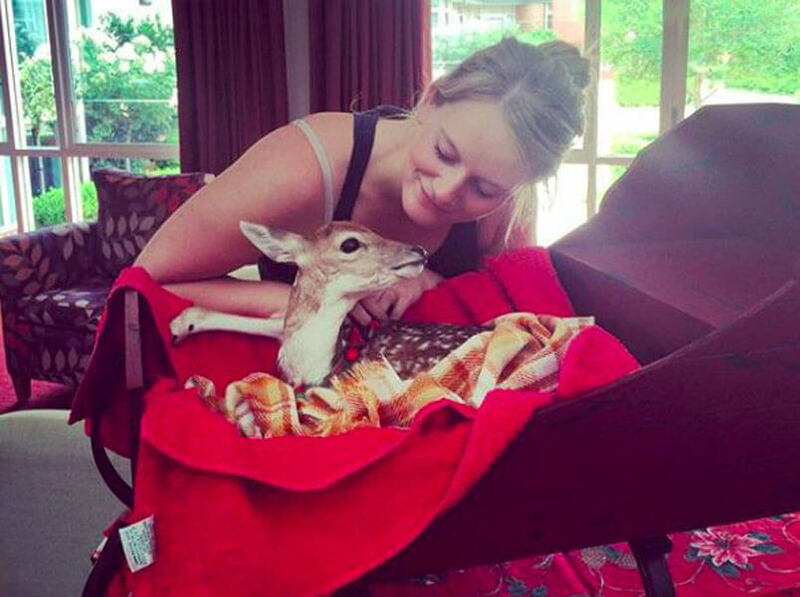 Thank goodness it was only a two-day period before rescuers discovered the helpless young deer. 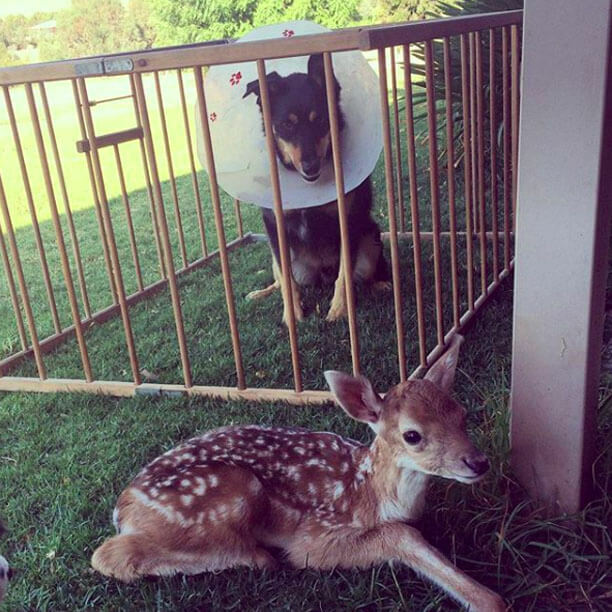 The group of strangers found Rudie with a horrible problem; he was missing one of his legs! It was partially severed in an accident and like any decent humans, they knew right away that Rudie needed some type of assistance. They weren’t just going to leave the poor baby there. Naturally, this seemed like a dire situation. When anyone finds any type of creature missing one of its extremities, they might fear the worst and hope for the best. The rescuers knew they had to help Rudie. When you find an animal in a severe condition like this, one of the first questions you ask is what happened? Since it was only two days after he was born, it could have been a birth defect. Rudie could have also been struck by a car. 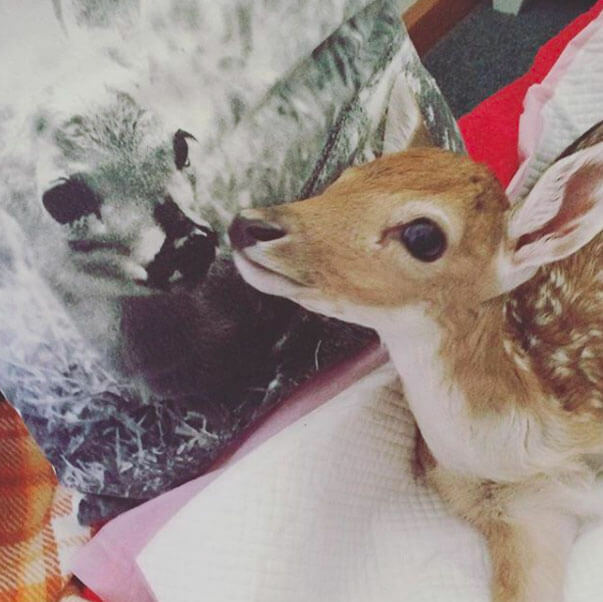 There were many things that could have happened to the young deer. Unfortunately, the strangers couldn’t say what exactly happened to him. All they knew was that he was in dire need of help. The grass was greener for young Rudie after all. Despite the horrible condition he was in, he had a successful surgery. The veterinarian was able to operate on the severed leg and completely amputate the remainder of it! Even though it meant he was going to live the rest of his life with a disability, it was a win for the little guy. Everyone was happy that he had a chance to live, with or without that fourth leg. Rewind the story for a moment and remember where little Rudie’s origin story began. 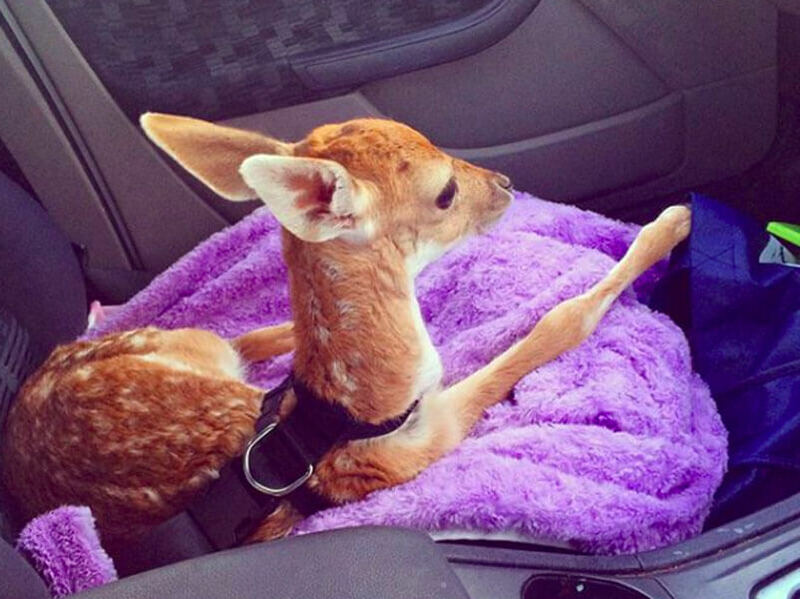 He was found by a group of strangers, abandoned on the side of the road with a badly injured leg. That meant he didn’t have a real family anymore. The veterinary staff realized that he would need to have a place to call his own. They couldn’t release him back to the wild due to his new condition and a lack of parental care. It would be hard for anybody to pass up taking care of Rudie after hearing and seeing what he’d been through. 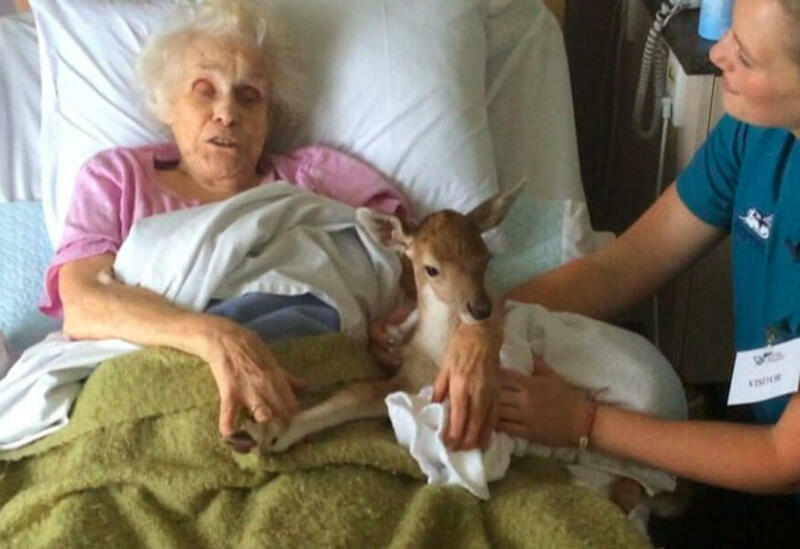 Unfortunately, not everyone is equipped or knows how to care for a young deer. But then, just moments later, someone stepped up to the plate. A veterinary who assisted with Rudie’s procedure, and an animal lover herself, elected to be the one to tend to the precious little animal. She wanted to give Rudie a forever home. 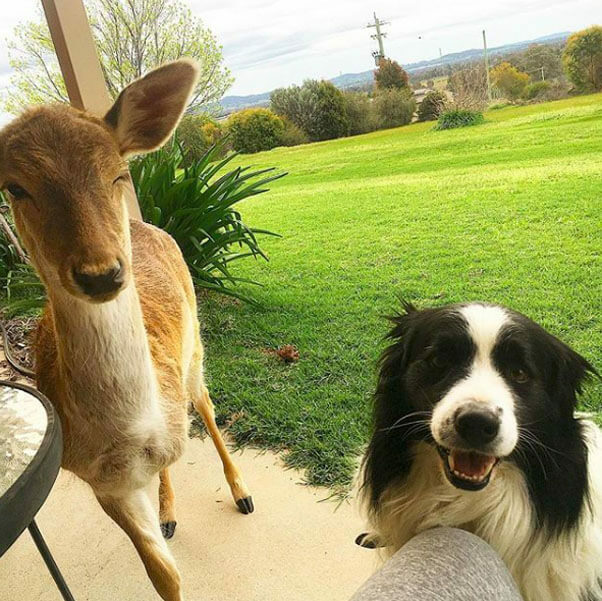 Naturally, a wild animal like a deer isn’t supposed to be living in a home or anywhere outside of its natural habitat. That’s just not how nature works. This was a special case, however. At first, the transition for tough for Rudie. Rudie was so young, but the veterinary technician did all in her power to make things comfortable for him. Since Rudie had such a hard start from the beginning of his life, she was dedicated to improving it from there on out. With a little love and care, a lot of miracles can happen. Short by one leg, Rudie’s life had changed forever, but the technician’s persistence was extremely helpful. Rudie had a certain eagerness about him as well that helped him to thrive in the new habitat. Sometimes you can pick up on certain traits from animals. For Rudie, a characteristic that people noticed was that he had a lot of fight in him. That and he was adorable! Evolution didn’t intend on Rudie to live his life with only three limbs, but that didn’t stop him. Since he was practically born that way, he began to learn how to operate with just three legs sooner rather than later. Rudie was walking around the backyard like he owned the place and eating meals regularly. He was such a trooper that he fit in with the other animals very easily as well. The technician was so proud of this! Just like with humans, some animals tend to hit it off faster with others and create bonds better than they would with another animal. For Rudie, he was very fond of the technician’s dog. When you’re nice, you tend to get along with others better. People and animals both prefer others who are caring and endearing. 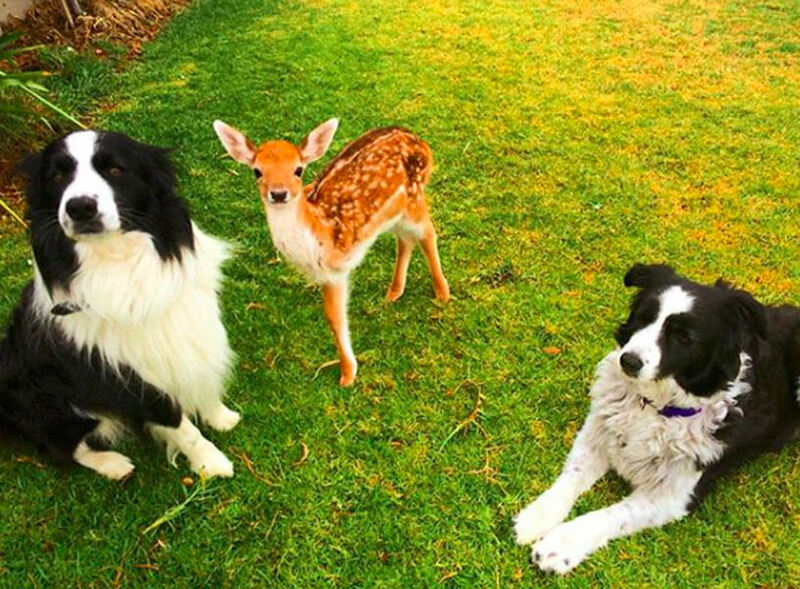 The technician believed that Rudie’s sweet demeanor is what led to him blending in with the other animals so well. She’s saved dozens of other animals before so she knew it could be challenging sometimes for them. Not for Rudie, though. It was like he was meant to be there and fit right in like a glove. Adoption was the next step of the process so that she could become the official owner of Rudie. Once she adopted the little guy, she went ahead and made him his own Instagram. This was to share his new adventures. She showed just how well he was living in his new forever home. 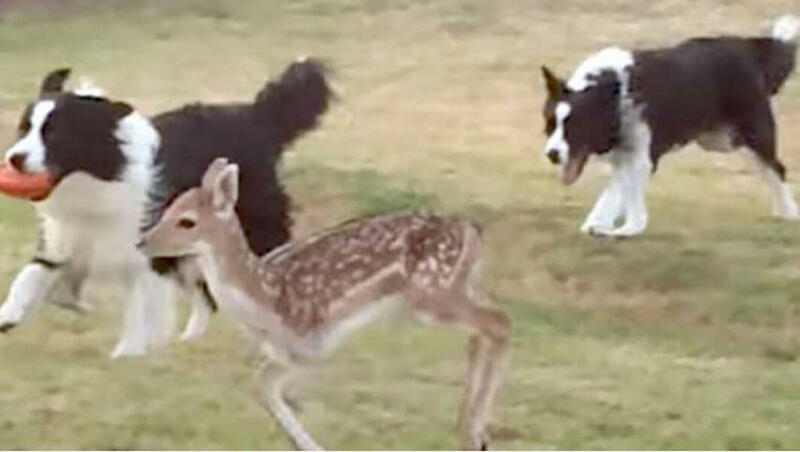 She even took it another level higher when she brought in one more deer who was almost the same age as little Rudie. Remember how we said earlier that people love to be around other nice people? Well, that definitely applies to animals! Some schools even bring in dogs during finals week to let the students pet them in hopes of relieving stress. Rudie was such a joy to be around that his new mother brought him to local nursing homes. Rudie would spend time with and bring pleasure to the people who lived there. This lady was certainly very happy to see Rudie! What do you think the response was to Rudie’s Instagram profile was after it was created? Well, it was nothing but a success! Since its launch, the page has gathered thousands of followers just to brighten their days. Who wouldn’t want to see this cute little guy on their social feeds? 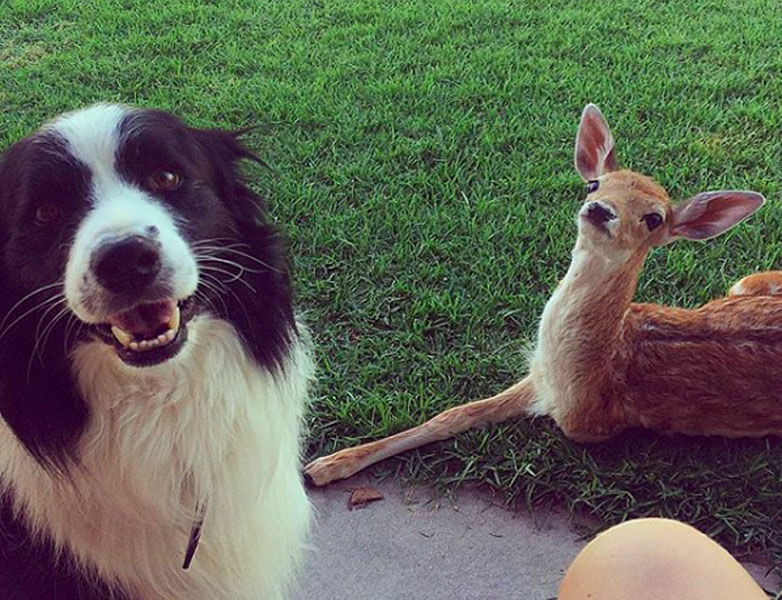 Even this picture of him mingling with one of the other adoptive animals is priceless. 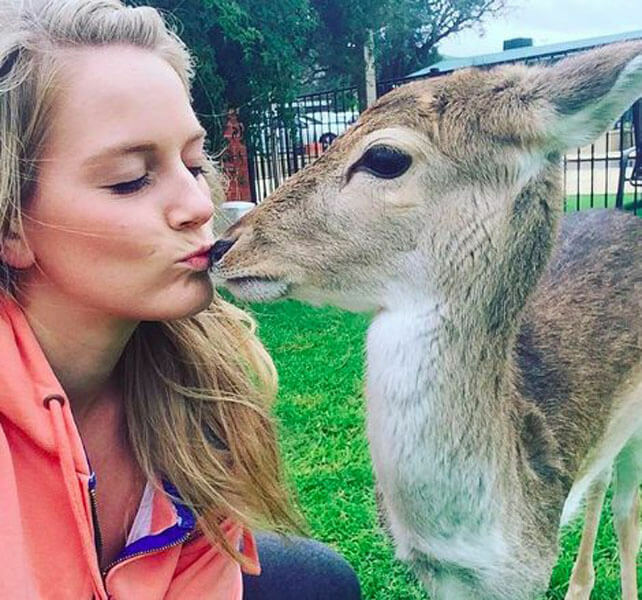 Who knew a three-legged deer could bring so much happiness to our lives? Some are naturally charming and then others can add another level to their personality and become silly! That’s something Rudie was exceptionally well at doing. All you have to do is see this picture of him in his Halloween costume to get a sense for his humor. Even dressed as a terrifying creature (a hammerhead shark), he still manages to be the cutest thing around. 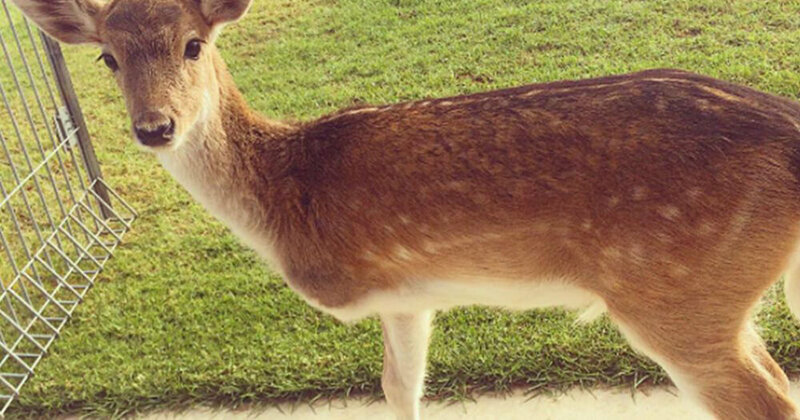 It’s almost impossible not to fall in love with Rudie the deer. We feel sorry for all the other cute animals who have lost some attention due to this guy. PDA (public display of affection) was something Rudie didn’t shy away from. He actually seemingly became more photogenic in moments like that. It was like the love gave him energy and he wanted to show that he appreciated it. Unlike humans who might become embarrassed or shy when their mothers try and show them affection in front of others, Rudie was the complete opposite. This picture here is the proof of that. 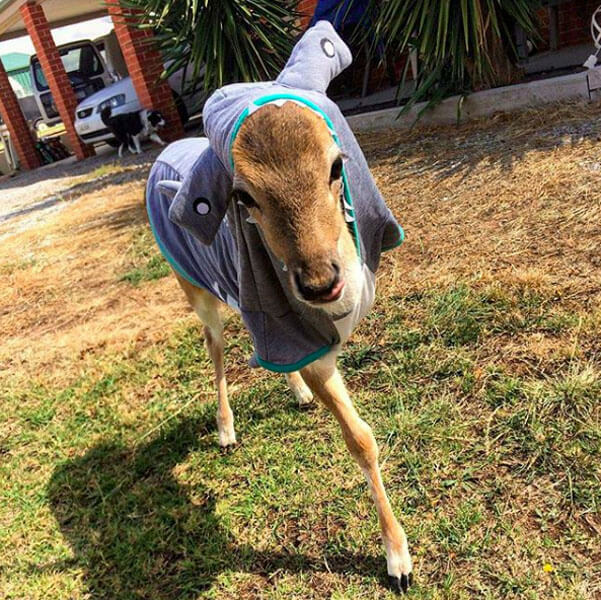 What isn’t there to like about this deer! In a way, it was like Rudie acts like the most adorable child you’ve ever met. You know, the one that runs around and makes cute faces and whenever you interact with them they make you smile? That was Rudie, but in deer form. Just take a gander at this picture of Rudie with his good dog friend. Rudie is winking at us! 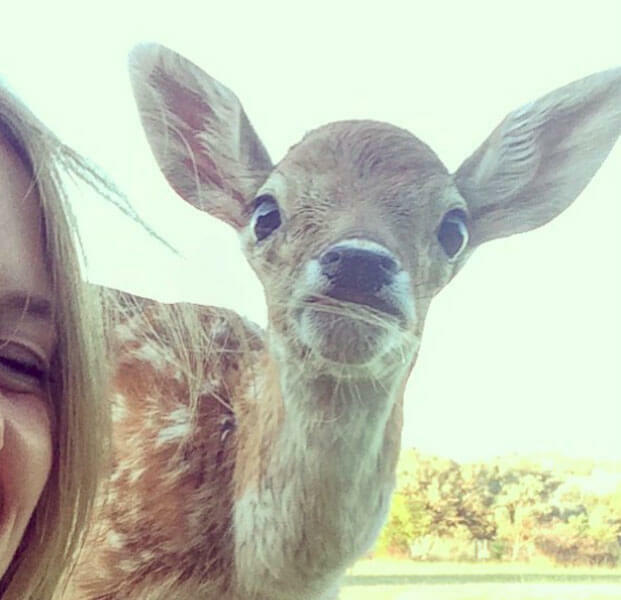 Have you ever known a deer to wink while taking a picture? 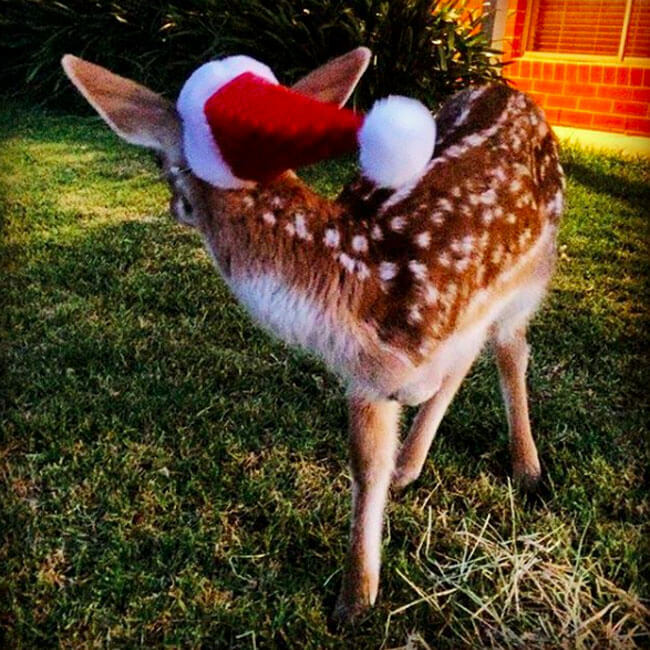 Is that one of Santa’s reindeer? No, it can’t be! It’s just good ol’ Rudie posing with a Christmas hat on his head. He really enjoyed getting into the spirit of Christmas. This might be the shyest he’s looked in any photo he’s taken. He was very happy to dress up in his favorite Santa hat whenever the occasion came around. It was like he was auditioning to fly around with the sleigh full of toys. Rudie is one of the most special and unique animals the technician had ever adopted and rescued. He didn’t let his hardships get in his way of living his fullest life. 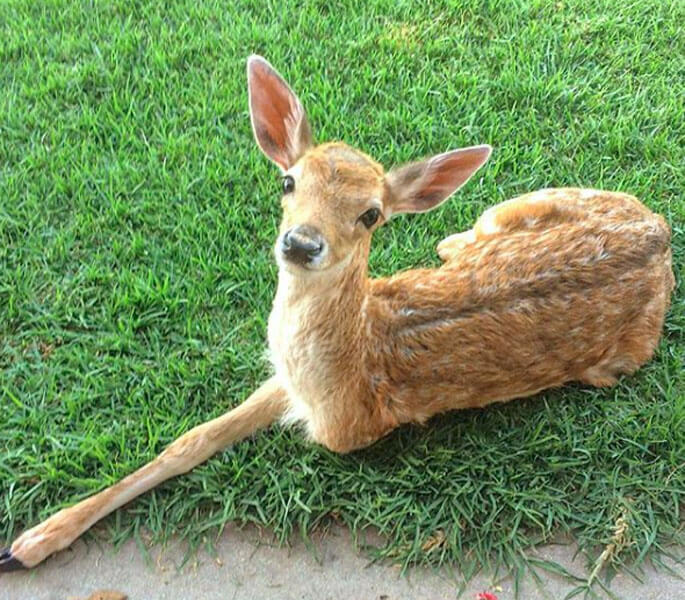 He was just like every other deer out there, just with three legs instead of four. He has a strong will to survive and wants to live a happy life. He is braver and stronger than you could imagine. Just look at him gallop with the others!